Sarda has used design to convey a sense of tradition and heritage, rendering a premium look. The milk is packaged in glass bottles much like it used to be in the good old days, before the poly-pack milk trend began. 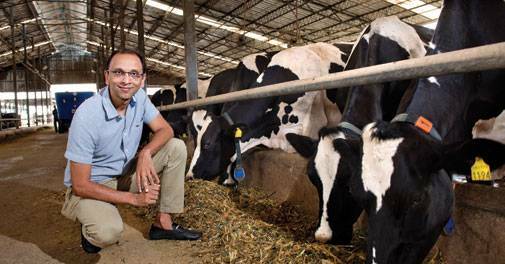 When Shrirang Sarda, Founder, Sarda Farms, forayed into the dairy business in 2013, he was keen on giving consumers the old-world experience of getting fresh milk delivered at their doorsteps - a luxury in today's times. He painstakingly bred a herd of 1,300 Holstein cows on his sprawling 11-acre farm in the outskirts of Nashik. He imported the sperms of Holstein bulls from Holland and injected the herd. The milk farm is completely mechanised - the whole process from milking the cows to aggregation and finally packaging is automated, with zilch human intervention. "I was clear that when I foray into the dairy business, I will not get into the aggregation model (collecting milk from multiple farmers - a practice followed by most dairy manufacturers in India) which is prone to adulteration. I decided to have my own farm from day one," says Sarda. He spent months learning the best practices in dairy on the farms of Holland and Denmark. The fresh, uncontaminated milk offering comes at an added cost because owning a farm and producing milk is far more expensive than buying from farmers. The cost of producing one litre of Sarda Milk is at least Rs 10 per litre more than sourcing from a farmer. Therefore, he decided to price the milk at a premium - Rs 90 per litre, as opposed to Rs 40 per litre from most other brands. Sarda has used design to convey a sense of tradition and heritage, rendering a premium look. The milk is packaged in glass bottles much like it used to be in the good old days, before the poly-pack milk trend began. "We have been focusing a lot on customer experience and satisfaction"
The milk is delivered to a consumer's home directly from the farm, bereft of any handling by intermediaries, unlike the milk in pouches that is delivered four days after production. Alok Nanda, Founder and CEO, Alok Nanda and Company, which handles branding and communication for Sarda Farms, says the idea of using glass bottles came from the memory of milk being traditionally delivered in glass bottles straight from the farmer's home. "This implies purity," he says, adding, "Milk packaged in plastic pouches is about a two-decade-old phenomenon done to cut costs, and there are enough stories of contamination and adulteration of packaged milk." Unlike most brands which sell their products out of retail stores, Sarda Farms reaches consumers only through invitation. So, if consumers of Sarda Farms recommend names of their acquaintances who could be prospective consumers, a personal invite along with a bottle of milk is sent out by the founder himself. In fact, Sarda says he has grown the brand only through word of mouth. "We were delivering it to only 180 homes when we started in 2013," he informs. The three-year-old brand now delivers to 6,500 homes in Mumbai and Nashik. Fresh milk straight from the farm is a luxury many deem a necessity. The first thing that struck Rashi Srivastav, an interior designer, about Sarda milk was the glass bottle. However, what won her over was the promise of fresh, unadulterated milk. "Most of the packaged milk brands available in the market get to us almost a week after the milk is collected. With Sarda Farms, I am assured of getting fresh milk straight from the farms, and the milk is distinctly fresh," says Srivastav, adding that she is willing to pay any price to ensure her five-year-old daughter's nutrition needs are not compromised. Like her, 35-year-old Shraddha Sharma, a homemaker who lives in the up-market suburb of Bandra in Mumbai, does not mind "paying a premium for purity". The premium milk brand is gaining popularity among prominent corporate head honchos as well as Bollywood A-listers. "We are adding at least 20 customers per day," Sarda claims. The company has eliminated intermediaries by owning the entire supply chain from the farm to the consumer's doorstep. "We own 200-odd motorcycles in Mumbai through which the last mile delivery is done," Sarda says. The farm generates around 10,000 litres of milk per day which is delivered to consumers' doorsteps between 5 am and 7 am. "Our vans are air-conditioned; we also put glycol packs which keeps the milk cool for at least a couple of hours after it is taken off the vans." Sarda also offers consumers personalisation by allowing them to choose from doorstep delivery, door-bell delivery and hand delivery. Sarda Farms is, today, a Rs 45-crore business. The company has launched its brand of ghee and curd, which are also priced at a huge premium - a 1 kg pack of Sarda Ghee is priced at Rs 900 (as opposed to at 1 kg pack of Amul Ghee, which is priced at Rs 390). The company is yet to make profits, though Sarda is confident that it will be profitable in less than a year from now. Gaurav Tandon, formerly Senior Consultant of Consumer Practice, A.T. Kearney, says that the milk business is an expensive one to crack, especially when one owns his own cattle and also manages distribution. However, he believes, a cow farm makes better economic sense than a buffalo farm. "Cows have a longer milking cycle than buffaloes. Also, the milking process of buffaloes cannot be automated - the milking machines are designed more for cows." There is a growing entrepreneurial interest in premium milk. Sarda has competition from brands such as Pride of Cows and Blissfresh - premium milk brands with the farm-to-home business model. While Blissfresh has been set up by former employees of Ratnakar Bank, Pride of Cows is an initiative of Parag Milk Foods, which owns the GO brand. "We started Pride of Cows to give an insight to the farmers we aggregate milk from about the best practices in milk farming," said Devendra Shah, CMD of Parag Milk Foods, in an earlier interview with Business Today. While Tandon is certain that there is a market for premium milk, he recommends that Sarda Farms add "fortifications" to the milk to justify its Rs 90 price point. Experts feel that scaling up a farm-to-home model would be an expensive affair and hence challenging. "Consumers are ready to pay a premium if the product is unique and desirable. However, scalability would be a challenge considering the need for consistency and relatively high costs in niche segments for small players where volumes may not justify," points out Devendra Chawla, Group President, Future Group. Sarda is aware of the hurdles in scaling up a niche brand, and has chosen to get the system in place instead of mindlessly going on an expansion spree. The company, in the last six months, has launched a website and an app which allows customers to make payments, give feedback on the product online, and inform the company about dates on which they do not want milk to be delivered. "We have been focusing a lot on customer experience and satisfaction, for which we have invested generously in technology. In fact, the last few months have given us the highest growth." Sarda is leaving no stone unturned to make it a delectable experience for his consumers.